Lombok is a beautiful island paradise next door to Bali. We spent a couple of days on a stunning beach side resort here, primarily learning how to surf. Surfing is the big draw here, as each November to March the island’s southern coast creates some of the best waves in Indonesia. It was actually Western surfers who first “discovered” Lombok and spread the word about the Indonesian island to other tourists! If you want to explore a beautiful island in Indonesia that’s similar to Bali without the insane crowds, Lombok is a great choice. It’s next door and has waterfalls, beaches and mountains for stunning scenery. There are luxury resorts, surf camps and party islands all in the area so you’re guaranteed to find something you like! Today we’re sharing some of the best things to do in Lombok and some tips for when to go and what to see! The island of Lombok is located in Indonesia’s West Nusa Tenggara province, just east of its more famous neighbor Bali. With incredible soft sandy beaches, colorful marine life and a majestic volcano, Lombok has lots to offer. The capital and largest city on Lombok island is Mataram. Most visitors arrive and depart straight for the trio of sandy white inlets off the north-west coast: party heavy Gili Trawangan, stylish Gili Air and rustic Gili Meno. The most famous and largest of the Gili Islands is nicknamed Gili T, but all three are famously free of motor vehicles. The Gilis are very popular for people who want to learn to scuba dive or freedive. In August, prices skyrocket as the small island becomes flooded with backpackers and partiers (mostly Brits and Aussies). Meanwhile, Lombok is known for its incredible surfing and beautiful natural scenery. You’ll find lots of luxury five-star resorts here and more families and young couples. If you like to hike or trek, make sure to give Lombok a visit. Indonesia’s second highest mountain, Gunung Rinjana, is located here. It’s especially popular for hikers who love the 2 day challenge of reaching the 3,762 meter high peak. We split our time and visited both and would definitely recommend seeing both islands as they’re quite different. Lombok is ideal to visit at any time of the year since its tropical climate brings year round warm weather. There are two main seasons, dry season and wet season. Despite what you might think, Lombok’s most popular time to visit is during the west season since this is when surfing breaks are best! Before you visit, pick up the Lonely Planet Indonesia guidebook for a comprehensive guide on local restaurants, hot spots and prices. If you have Kindle Unlimited, you can download the Bali Lombok guidebook for free! There are daily flights from Bali’s Denpasar Airport to Lombok International Airport. 4 Indonesian airlines make the ~30 minute journey, including Garuda Airlines, Lion Air, Silk Air and Trans Nusa. The airport is then about 20 minutes to Kuta by car – we suggest booking your airport transfer in advance to avoid the swarm of drivers. The public ferry connects Bali at Padangbai and makes the 4 hour trip to Lombok via Lembar. It’s a choppy, slow journey but you can take your motorbike and car on board. Alternatively, a popular and cheaper option is to take the fast boat. You can hop on at either of Bali’s departure points: Serangan or Padang Bai Harbour. We visited in October and these fast boats filled up quickly in high season so try booking in advance. They’re also quite small boats so if you have a lot of luggage, you might prefer to fly. To get around Lombok, rent your own motorcycle or take a cab. You can also download the app Ojek, which is like the Indonesian version of Uber. It uses motorbikes instead of cars, to better navigate Indonesia’s crazy traffic! For the airport, you can hire a private transfer for around $30. On the mainland, most tourists visiting Lombok stay in either Senggigi or Kuta. Senggigi has luxury hotels and enclosed resorts while Kuta is closer to the sights and action. We stayed at the Novotel Lombok, a lush indoor/outdoor hotel that was beautiful. The resort is beautifully designed in the local Sasak style (the Muslim indigenous people in Lombok) and located right on the beautiful blue bay of Kuta’s beach. From yoga in the mornings to Indonesian cooking classes in the afternoons, you could spend all day at this stunning resort and never leave! We loved the huge villa-style rooms and soft sandy beach out back… cows even greeted us here at breakfast! The Novotel is perfect for couples and families who want to relax and live large in Lombok. If you prefer to head straight to the Gili Islands, you have your pick of the trio. Most people stay on Gili Trawangan, or Gili T as it’s nicknamed, since this is where all the hotels, restaurants and bars are located (and those Instagram famous beach swings!). Gili feels very similar to downtown Cancun and is perfect for a girls getaway or party vacation. We loved this hotel, which is one of the more luxurious options on the island and conveniently located right across the main boat dock. Each villa room is HUGE and we got one with a huge outdoor bathroom that was really fun. There are lots of swimming pools, lounge areas and hammocks on the hotel property as well. Best of all, they took care of our boat transfer from Lombok! If you’ve got limited time, I’ve listed the top 10 things to do in Lombok first, in order of the most popular and unique things to do on the island. If you’ve got more time, then check out the full list! Kuta Beach is Lombok’s most famous beach and beautiful. Lots of coral, salty ocean air and people selling souvenirs. Kuta was originally a sleepy fishing village and you can still see the local villagers in the area. Note: Both Bali and Lombok have beaches named ‘Kuta’ – we thought Lombok’s version had cleaner sand and more dramatic waves. This is another fabulous white sandy beach in Lombok that’s perfect for sunbathing, swimming and relaxation. There are lots of hills which surround the beach so it’s a nice place to catch sunset and take some photos. Tanjung Aan Beach is nicknamed ‘the world’s best wave’ as it draws surfers from all over the world. Peak surfing season is from May to October, when you’ll find long, hollow ‘barrel’ like waves. If you’re hungry, there are some cozy warungs, or restaurants, offering tasty local food. The Gili Islands are one of the most places to dive in Indonesia. They’re small tropical diving meccas, filled with inexpensive dive shops that offer excellent scuba certification programs and world-class coral reefs teeming with underwater marine life. Each of the three Gili islands are great for diving or snorkeling – for a party atmosphere head to Gili Trawangan, for rest and relaxation choose Gili Air and for the best diving pick Gili Meno. If you want to take a day trip to the Gili islands and snorkel, this tour handles round trip transportation, all gear and a guide. Check availability & rates here. This guided tour handles round trip transportation and takes just half a day! Lombok’s interior has some of the most tranquil and beautiful waterfalls in all of Indonesia. Typically, you’ll need to hire a guide to show you the hiking path as Lombok’s interior is a dense forest. Two of Lombok’s most popular waterfalls are located in the north, near the village of Senaru, as they are located at the base of Mount Rinjani. Sendang Gile waterfall and Tiu Kelep waterfall are both worth a visit as they’re conveniently on the same path! The first waterfall, Sendang Gile, is just 15 minutes walking from the entrance and is a two tiered waterfall with a shallow river. If you continue trekking into the forest for about 45 minutes, you’ll find Tiu Kelep, a huge misty amphitheater with streams of waterfalls and a gigantic diagonal waterfall! This guided tour takes you to both waterfalls and includes a guide and transportation. Mount Rinjani is the second highest volcano in Indonesia and still active! Mt. Rinjani is a sacred mountain to not only the Sasaks, but also Hindus who believe Rinjani is one of 3 sacred Indonesian mountains. They make pilgrimages to the summit and lake to leave offerings for the gods and spirits. If you’re up for it, trekking Rinjani is one of the most popular adventure things to do in Lombok and each year, the number of hikers doubles. The trek takes a full 3 days but once you reach the summit, you’ll be rewarded with stunning panorama views of not only Lombok island but also Bali, Sumbawa and Segara Anak Lake. After you descend, you can visit the lake and hot springs to ease your muscles after the grueling climb. Trekking season opens during dry season and is best climbed in April / May when spring weather brings the prettiest views. Because the multi day hike is quite grueling, it’s highly recommended to book a guide and porters to show you the way and also to help with supplies and gear. This tour in particular gets great reviews. Ashtari is one of the most famous restaurants in Kuta, located high up in the mountains. It’s quite popular for its yoga classes and beautiful restaurant views over Kuta beach. They offer 8 different types of yoga classes as well as Indonesian cooking classes so it’s a great way to spend the afternoon. After your class, have a leisurely lunch on the deck to admire the beautiful forest views or grab a fun cocktail to watch the sunset! If you don’t have time for an extended trip, even a quick day tour of the Gili Islands is a fun way to explore. Gili Trawangan is just 20 minutes by boat from Lombok and small enough that you can bike the entire circumference in a couple of hours. Make sure to take a picture on the sunset swings in the ocean! Each island is unique – Gili T is famous for its bars and nightlife while scuba divers love the reefs and marine life. If you only have time to visit one, head to Gili T as it’s the largest and most commercially developed. A great day trip from Lombok is to visit the three islands of Gili Nanggu, Sudak and Kedis. Hire a guided tour or try to catch a local fishing boat from Lombok’s Tawun Harbor. You can easily visit all 3 islands on a full day tour and typically they’ll stop first at Kedis, which is a small island with a sandy beach and lots of coral. It’s a quiet, remote beach great for snorkeling and there are little bungalows you can rent if you wanted to stay the night. Nanggu is famous for its coral reefs and many documentaries have been filmed here to help construct new reefs to boost marine life. Finally, Sudak is a tiny island, also good for snorkeling as the water is clear with lots of fish and great visibility. If you can, bring along a GoPro or underwater camera to get some great shots with the colorful fish! You can also have lunch on the islands. Try sambal, barbecued squid and fresh fish. Mawi Beach is another pretty beach in Lombok with a couple of food shacks and crystal clear waters. Grab a banana juice or a fresh coconut and sunbathe! The waves are great for surfing so expect to see lots of locals testing the waves. Lombok has its own rice paddies called Bukit Selong rice fields. Unlike the terraced rice paddies in Bali, in Lombok you’ll find a colorful quilt of farm plots in a low valley. If you climb high up, you’ll find great views of the rice fields and there’s even a star-shaped wooden deck to get higher up. We saw mostly locals around as this isn’t one of the more popular things to do in Lombok (I think only locals know the spot). 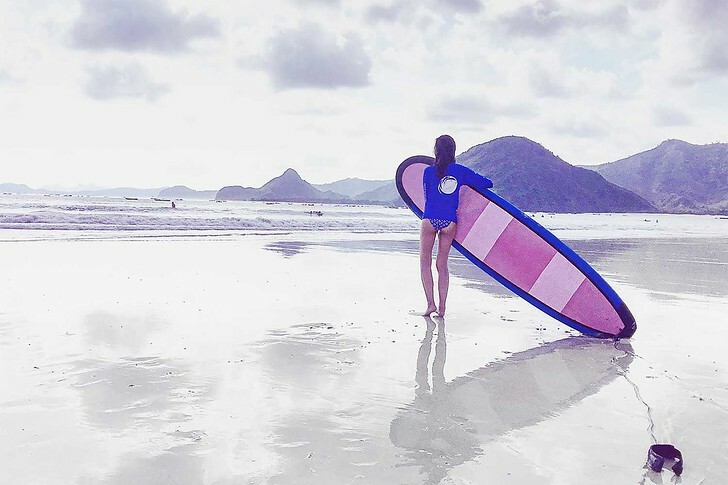 Lombok has its own version of a pink beach, called Tangsi Beach, which is in East Lombok. There are only 10 pink beaches in the world and Indonesia claims 2 (the other is on the island of Flores). Tangsi is about a 2 hour drive from Mataram and its secluded location leaves it quite untouched from tourists. Hire a driver to take you here for the day and swim in the ocean. Just don’t expect fluorescent pink – the sand here is more of a peachy-beige rather than pink. There’s few developments so you will need to bring your own food, water sports, etc. There aren’t even bathrooms! If you want crystal clear water without any other tourists, then it’s perfect. On Lombok’s coastline, you can find a crazy vertical rock formation called Batu Payung. Over thousands of years, erosion has buffed away the rock into this unique formation right along the beach! A great way to get there is to rent a motorbike so you can drive along Lombok’s coast on your own and take in the ocean waves, sandy beaches and lush green hills. Selong Belanak is a beautiful beach in south Lombok, known for warm white sandy and great waves. This is a surfer’s beach and great for beginners or those wanting to practice their surf skills. Along along the beach are shops renting surfboards and offering surf lessons. We found it was about 50,000 IDR to rent a board for 2 hours and we chose to take a lesson, which was great! We each got an instructor who helped us and after a couple of hours we felt like we had the basics down! Try to leave all your stuff at home since there’s really no secure area to store it. If you want a beach for swimming, we would recommend other beaches on our list. Here, there are beginner and intermediate surfers everywhere so it’s a little rough to swim. Selong Belanak is especially popular at sunset since the skies are dramatic and vivid! There are lots of casual warungs offering food as well so it’s a great place to spend the afternoon. The Sasak are the indigenous people of Lombok and related to the Balinese, but they practice pre-Islamic beliefs and are predominantly Muslim as opposed to Hindu. A great cultural thing to do in Lombok is to visit a traditional Sasak village to learn about their traditional way of life and history. It includes lunch, air-conditioned transportation and a beach visit to Tanjung Aan if you want to swim or snorkel! If you love elephants, visit the sanctuary in Lombok where you can learn about their daily routine, help bathe them and do a safari ride! Lombok Elephant Park is a great family friendly activity as they also have other animals in the park – from pretty tropical birds to loud, bold monkeys. Ayam Taliwang – small free range chickens that are drenched in a spicy marinade made from garlic, chili and shrimp paste, then grilled to order on an open rack – so delicious! Ayam Balap Puyuh – fried chicken with rice. It’s typically served on a banana leaf which is fun and pretty to eat! Satay Rembiga – you can’t visit Indonesia and not have at least one satay. Lombok satay has its own unique sweet and spicy flavor. It’s also quite popular to have seafood barbecues on the beach. Or, if you want to stick to your healthy diet you can find some cafes that make health bowls and juices. And that’s it! Our top tips for visiting Lombok, Indonesia. What will you do first?